Are the famous vacation destinations of Batanes, Boracay or Coron included in your travel bucket list for 2017? You better check this latest Skyjet seat sale 2017 to these amazing vacation havens! You may book the Skyjet promo fare on December 17 and 18 2016 at Duty Free Columbia Complex. 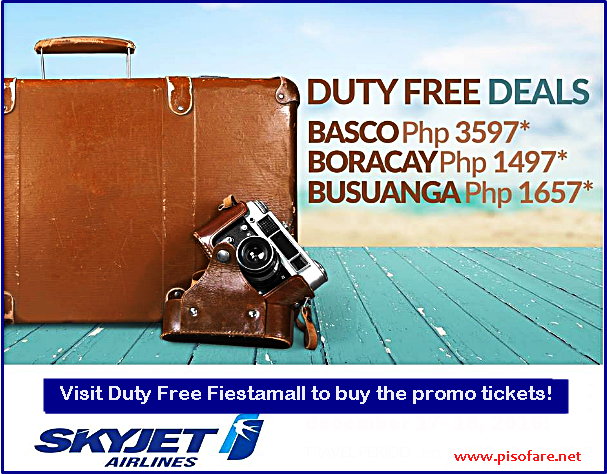 The sale is open to the general public and passport is not needed when you visit the Duty Free Fiesta Mall. The Skyjet low fares are great for January 2017, February 2017, March 2017, April 2017, May 2017, June 2017, July 2017, August 2017, September 2017, October 2017 trips to Boracay, Batanes, or Coron (Busuanga). The Skyjet promo fare 2017 can be purchased at Duty Free Fiestamall, Columbia Complex, Ninoy Aquino Avenue, Paranaque City on December 17 and 18, 2016. Location of the Skyjet booth is besides Cjhowking in the fast food premises. Skyjet promo tickets are inclusive of 12% VAT and good for one-way travel only from or to Manila from Boracay, Batanes and Coron. Booking for roundtrip travel can be also done. The Skyjet cheap tickets include 5 kg hand carry bags, 10 kg checked baggage (adults) or 5 kg checked baggage (children). Excess checked baggage is charged at P150/kg including VAT. Promo tickets are non-transferable, non-reroutable, non-refundable, non-rebookable and non-endorsable. Please call Skyjet hotline at (02) 863 1333 for any inquiries. To help you plan your vacation, check the List of 2017 Philippine holidays and long weekends. Limited tickets on sale! Buy your cheap tickets on December 17 and 18 as soon as Skyjet booth open for business! PISO FARE Tickets is on Facebook! LIKE and FOLLOW us for more promo fare, PISO FARE and travel updates of Skyjet, Philippine Airlines, Air Asia and Cebu Pacific!! !